SearchReSearch: Answer: What beach am I on? Answer: What beach am I on? And yes, the mountain on the far left of the photograph is a dead giveaway (it’s Sugarloaf), but only if you’ve seen it before. But I’m getting ahead of myself. 1. The most common solution was that the searcher immediately recognized my hint “Nearby there’s a very famous statue that’s clad with an exterior of steatite that’s placed in very, very prominent location.” was a reference to the famous statute “Christ the Redeemer” (or Cristo Redentor, in Portuguese). The statue is prominently placed atop Corcovado (a local mountain top that's a truly impressive location). 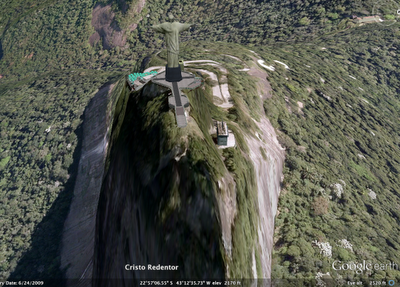 leads directly to the Cristo Redentor statue in Rio, perched on Corcovado. In my case, I went to Google Earth, found the statue, and looked to see what direction the right hand is pointing. As you can see in Google Earth, it’s almost exactly due east. Draw a line, and it hits the beach at Ipanema. BUT! 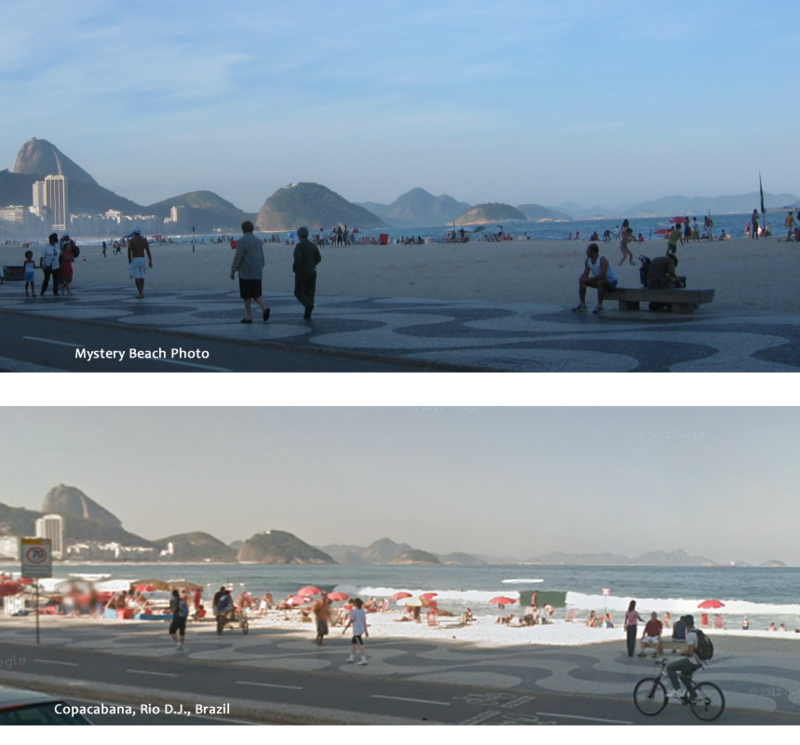 If you then check the picture of the Mystery Beach against a Streetview of the beach at Ipanema, you’ll quickly find that this really isn’t it, and it has to be the next beach to the east. (Why? Because the beach at Ipanema faces due south. You can’t see any mountains from Ipanema--you can spot islands, but not mountains on the mainland. In particular, you can’t see that big Sugarloaf mountain.) Thus, it has to be Copacabana, which is also more-or-less in the direction that the statue is pointing. 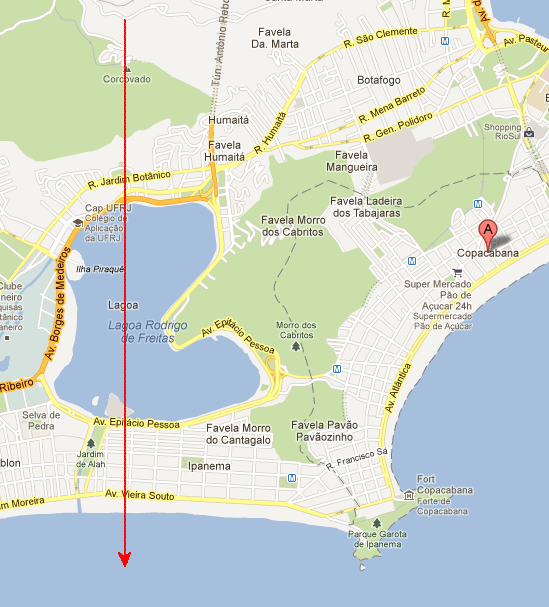 This search leads to both Ipanema and Copacabana as possible answers. (Which surprised the heck out of me! I didn’t even think about this as a possible solution path.) Interestingly, if you leave the term “beach” out of the query, the results aren’t nearly as good. Again, as with solution 1, if you check the Streetview, you’ll note that the beach at Ipanema has a hexagonal pattern in the sidewalk… Copacabana has a cool wave pattern. So.. the rightest answer is Copacabana. But if you thought it was Ipanema (a beach equally famous in song and story, listen to “Garota de Ipanema” --aka-- “The Girl from Ipanema”), I’ll count your answer correct as well. After all, when I was digging through my files to find this picture, it was labeled “Ipanema-2010.jpg” – so I had it wrong as well! Search lesson #1: Picking up on ALL of the cues in the photo (wavy lines in the sidewalk, the appearance of the mountains on the horizon) is a great way to verify that your guess is correct. Streetview to the rescue here—we can nearly match the photo with a Streetview image. It's important to notice that the sidewalk is very different at Ipanema... See the streetview shot of the beach at Ipanema below. Search lesson #2: As reader Drop the Gloves! pointed out, you can right-click on a Google Map to bring up the “What’s here?” menu option. 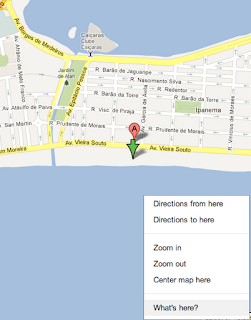 That’s how he found out that the location was Ipanema. This is a great tool to know when you’re looking at a map and can’t quite figure out what’s going on. It doesn’t work everywhere (we don’t know the name of every possible feature on the planet), but it works often enough (and nearly always in cities) to be really useful. To everyone who picked up on the wave vs. hexagonal pattern difference in the sidewalks—Excellent job! You’re all super-searchers in my book! I hadn’t thought of that as a possible solution path. Nicely done. 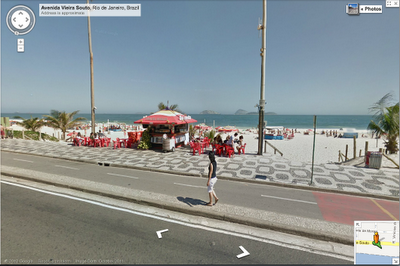 Silly me didn't use street view and thought it was Ipanema. This was pure laziness on my end and, as a librarian, should know better and verify my research. Answer: Will the Plex be underwater? Answer: A thousand years of Thanksgiving? Answer: What kind of animal can do that?